Product prices and availability are accurate as of 2019-04-12 00:49:21 EDT and are subject to change. Any price and availability information displayed on http://www.amazon.com/ at the time of purchase will apply to the purchase of this product. This is a 1973 Kentucky Derby Secretariat Signed Authentic 11X14 Photo that has been Personally Signed & Autographed by Ron Turcotte. This item is 100% Authentic to include a Certificate of Authenticity (COA) / hologram by PSA/DNA.This is a stock item. We have several of these available. 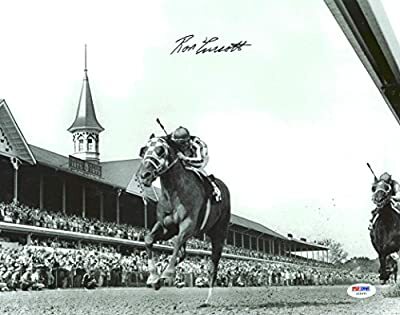 The one you will receive will be of equal quality to the one pictured.Press Pass Collectibles offers a 100% Lifetime Guarantee on all Autographed & Signed Ron Turcotte memorabilia.